Yay! I have a new nephew! 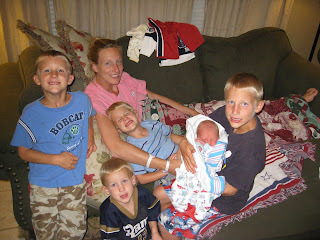 This is my oldest sister Elise with her adorable boys! What a classic picture. Five boys. Elise is in my prayers for sure. So cute, we have the best nephews! You have one more new nephew, one in Calif AND one in Utah! Perhaps you did not find a picture available to post of him. The number of nephews is growing fast! isn't it amazing!! Everyone's going to have like 6 kids, amanda will get married, start having hers, and I'll have to being adopting children from cambodia!! I will in 10 yrs! !